While that view may seem like it hasn’t changed in a thousand years, Philpott Lake was actually constructed by the Army Corps of Engineers in 1953, and this year it celebrates its 65th anniversary. The 2,880-acre lake is filled with recreational opportunities for those who want to take advantage of this unique spot that many Virginians are unaware of. Here are just some of the ways to have a memorable time on your next trip to our neck of the woods. On a balmy summer day, the cool, clear water of Philpott Lake is irresistibly inviting. The sprawling lake is scattered with sandy swimming beaches, perfect for splashing around and sure to induce nostalgic memories of summer camp for adults that might be long overdue for a vacation. There are six designated swimming areas surrounding the lake. Kids will love the sandy beach and playground at the Bowens Creek Recreation Area. Runners can jog the 4.5-mile Dogwood Glen Trail before taking a dip the Salthouse Branch Recreation Area, and birders can spread a towel on the sand at Goose Point Recreation Area, while watching for belted kingfishers along the shore. Secluded Horseshoe Point Park is another family-friendly option, with a playground and changing facilities to help enjoy a day on the water. Philpott Lake is a paddler’s paradise, featuring flatwater that’s easy to navigate and filled with hidden nooks to explore. From secluded waterfalls to isolated fishing holes, the lake has something for everyone to enjoy. 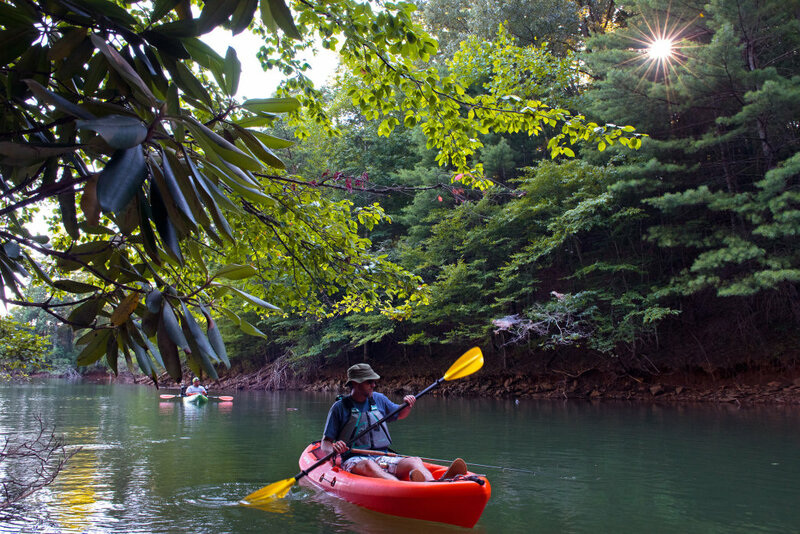 A dozen different parks ring the lake, and canoers and kayakers can craft tailor-made adventures to fit their interests, from family-friendly canoe trips to multi-sport expeditions combining kayaking, hiking, and biking. Explore the Philpott Lake Blueway, the 25-mile water trail that connects the lake’s boat launches, recreation areas, and scenic gems. Visiting paddlers can rent canoes or kayaks and arrange guided trips in the region at Smith River Outfitters in Bassett or On the Water Outfitter in Floyd. The Smith Mountain Wake Company offers all varieties of boat rentals. At the Jamison Mill campground, newcomers to boating can take lessons in stand-up paddleboarding and sea kayaking starting in July and the Concerts by Canoe series has musicians entertaining boaters while playing on a floating stage. Located at the southernmost edge of the lake, the amenity-loaded Philpott Marina is the perfect basecamp for any boating adventure. The newly built and modern marina is more than just a scenic launch spot— there are also rentable boat slips, short-terms use slips for visitors, fuel, and a store with snacks and fishing supplies. You’ll also find plenty of picnic tables and a full-service campground (with electrical hook-ups). The Philpott Marina Group Campground is located in a private setting overlooking Philpott Marina. The campground has 10 camping spaces each with electric, water and sewer connections. The facility also has a new restroom/shower facility, picnic pavilion, the use of two boat slips, hiking trail to the marina and gate that can be locked at night. Other points of entry for boaters on Philpott Lake include: Philpott Park, Bowens Creek, Goose Point, Salthouse Branch, Twin Ridge, Horseshoe Point, Jamison Mill, Ryans Branch, and Runnett Bag Park. The fishing scene is one of the biggest draws of Philpott Lake, which is a hotspot for walleye and harbors brawny largemouth bass in large numbers. Patient anglers can also hook more reclusive smallmouth bass, black crappie, and catfish. 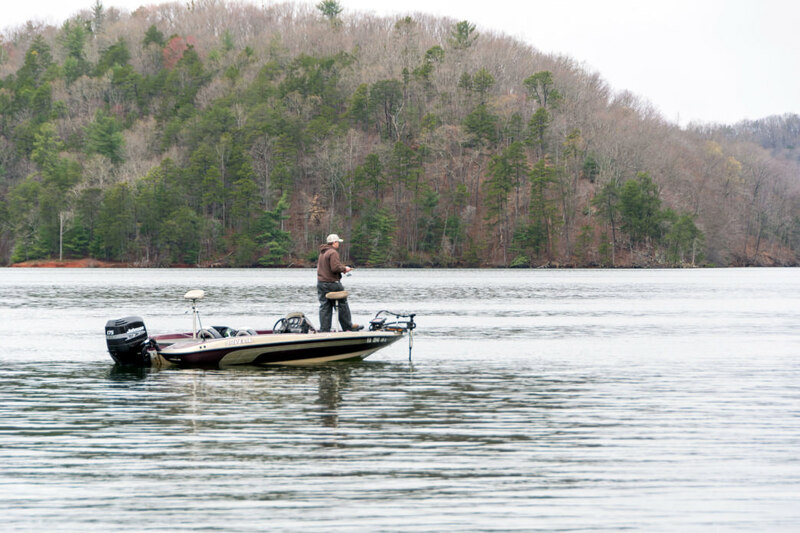 On the water, anglers can troll the rocky ledges along the shore for largemouth bass or seek out smallmouths in crystalline pockets of deep water in southern portion of the lake, near the Philpott Dam. Anglers have plenty of room to hook fish from the shoreline at the recreation areas ringing the lake. Stake out the Runnet Bag branch of the lake for the seasonal walleye spawn in the early spring, or fish for catfish in the shadowy water of Ryans Branch with smelly dough baits or chicken livers. The Twin Ridge Recreation Area is known for its fishing tournament facility, which is also handicap accessible. Featuring a postcard-worthy setting, Philpott Lake has become popular for stand-up paddleboarding (SUP). The placid, flatwater conditions make the lake ideal budding paddleboarders still getting their sea legs. With all the acreage to explore, experienced boarders will find enough open water to be entertained, too. First-timers can even warm up on smaller but adjacent Fairy Stone Lake, located in Fairy Stone Lake State Park. SUPs are available for rent at the park throughout the summer at several locations around the lake, including at Parrot Cove, Bridgewater Marina, and Smith Mountain Wake Company. Spread along the southwestern edge of Philpott Lake, Fairy Stone State Park is an idyllic detour. One of Virginia’s first five state parks created by the Civilian Conservation Corps in 1936, it is listed on the National Register of Historic Places. 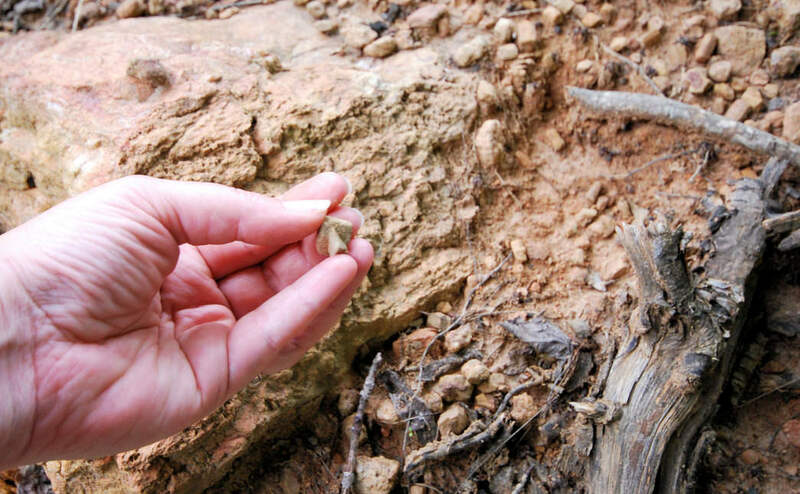 It’s named for the stunning staurolite crystals founds within its forests—storied to be the preserved tears of ancient fairies. Fairy Stone State Park is anchored by its own lagoon, the 168-acre Fairy Stone Lake, which sits beside sprawling Philpott Lake. Throughout the summer, and on weekends in the spring and fall, the park rents canoes, kayaks, and stand-up paddleboards, and a portion of the shimmering lake is roped off for swimmers between Memorial Day and Labor Day. By boat, cruise to the scenic waterfalls where Fairy Stone Lake tumbles into the Philpott Lake. One of the most unique on-the-water experiences at Philpott Lake is the chance to camp like a castaway at Deer Island. Located between the Twin Ridge and Goose Point recreation areas, the lake’s largest atoll is covered with 21 pine-shaded campsites scattered along the water, treating campers to both scenery and seclusion. If you’re looking for a more traditional campsite, you have your choice of options as well. No matter where you stay, you’ll be treated to an unforgettable getaway.